The National Corvette Museum (NCM) in Bowling Green, Kentucky is more than a shrine to all things Corvette: It is also home to a super-smooth 3.2 mile automotive asphalt test track; one whose paving specifications prohibited surface deviations exceeding a minuscule 1/8″ (3 mm) around the track. Add the requirement for a virtually seamless joint in the center of the course surface, which minimizes surface disruptions for cars traveling at high speeds, and the technical specs for the NCM test track are incredibly precise. This is why the NCM‘s construction contractor, Scotty’s Contracting & Stone of Bowling Green, used 3D grade and slope control systems to construct the earthworks and lay down the mix. Road contractors also refer to this system as 3D milling/paving. Also known as Automated Machine Guidance (AMG) 3D grade control is a system where milling machines and pavers are equipped with computer technology that controls the vertical position of their milling rotors or asphalt screeds. These controls follow CAD data files from the site plan loaded via thumb drives into their onboard computers; cross-referenced in real-time using GPS base stations placed in the work area that feed accurate positioning information to the pavers or mills. Producing the correct profile is important because this accurate profile allows the miller to cut and the paver to lay a roadbed whose thickness adheres uniformly to the road engineer’s design specifications. “This uniformity contributes to longer road life,” Lee said. Townes has examined how well 3D grade control systems perform – which he refers to as Automated Machine Guidance (AMG) – in a DOT case study of the Florida SR 417 lane-widening project. Available online, the SR 417 case study notes that the 4.1 mile highway section came with 43 milling transition points that left lots of room for human operator error. The result; using 3D grade control/AMG, the Florida DOT milling/paving of SR 417 resulted in an extremely smooth, consistent asphalt surface at a lower price. Money was saved by milling/paving to specification, rather than focusing on creating a uniform depth throughout: “The overbuild pavement required was significantly reduced from an anticipated 8,200 tons to 2,500 tons, translating to a savings of more than $350,000,” said Townes in the SR 417 case study. In general, “Paving operations were completed in fewer overall shifts, decreasing overhead and inspection costs and reducing delay for road users.” This is because 3D milling/paving reduces the need to do on-site staking and thus the requirement to have crews do this work on the job. This is the irony of 3D grade control as applied to roadways milling/paving. Although implementing this advanced technology does require adding infrastructure, equipment and crew training, the resulting reduction in man hours for surveying and error correction (plus reductions in paving material used) makes 3D-directed jobs less expensive to execute than traditional milling/paving jobs. 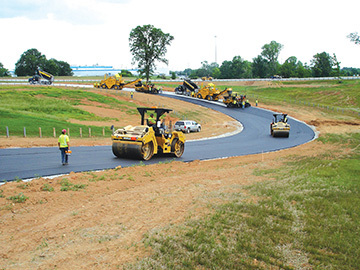 The bottom line: 3D grade control is a proven way for asphalt paving contractors to do their jobs more accurately, more quickly and more affordably for themselves and their customers.